Take your palette on a Mediterranean vacation with this exquisite pasta dish. It’s perfectly balanced with tangy and savory flavors. 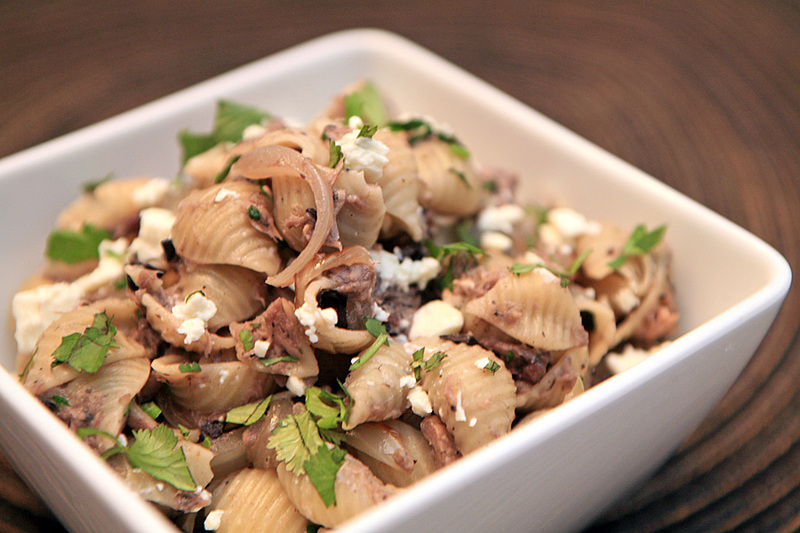 We used whole wheat pasta to add a nutty profile and to bump up the protein. If you’re looking for the perfect potluck dish with a wow factor, this recipe fits the bill. Plus, you can serve it hot or cold. Cook pasta in salted water according to the instructions on the box. Drain pasta and reserve about 1 cup of the starchy cooking liquid. Add cooked pasta to a medium prep bowl. In a large skillet over medium heat, add a good coating (two turns of the pan) of olive oil. Add your shallot and garlic. Season with salt and pepper and sauté for 3-4 minutes until the veggies become tender and the garlic starts to slightly brown. Add olives and tuna to the pan, continue to cook for 2-3 minutes. Deglaze the pan with 2-3 tbsp. of the reserved cooking liquid. Use a wooden spoon to scrape the bits and flavor from the bottom on the pan. The reserved cooking liquid will also help thicken the veggie mixture. Allow the flavors to combine over low heat for about a minute. Pour veggies over the pasta and add a few additional tbsps. of the reserved cooking liquid. Fold together and add in feta cheese and cilantro. Taste and finish with additional pinch salt and pepper, if needed. 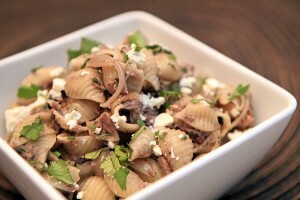 Spoon into bowls and garnish with remaining olives, feta cheese and cilantro.